Despite the technological evolution and availability of a large number of instant messaging apps, Facebook Messenger maintains a unique position in the market that seems to be almost unconquerable shortly. Now, with chatbot development and integration, you can leverage this platform to reach out to your audience. The number of Facebook Messenger users is growing exponentially from 600 million users in April 2015 to 900 million in June 2016 to 1 billion in July 2016 to 1.2 billion in April 2017. Thus, building a Facebook Messenger chatbot you can reach out to more customers. 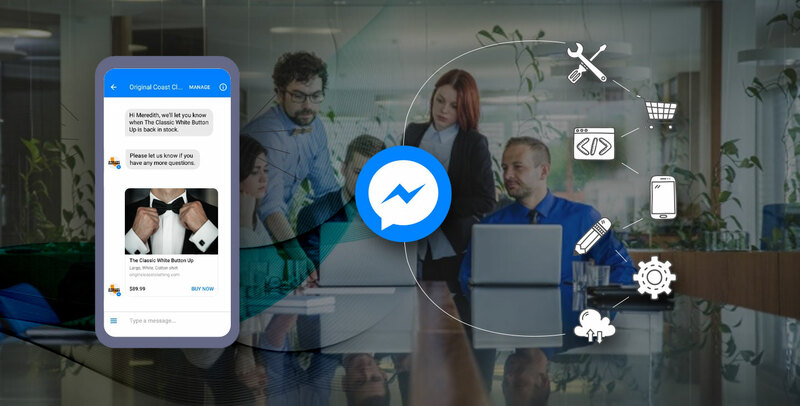 The latest version of Facebook Messenger 1.2 supports natural language processing, which means your chatbot can converse cognitively by understanding the intent of the communication. This imparts artificial intelligence to your chatbot that makes conversation engaging and result-oriented. With a Facebook Messenger chatbot you can accept payments from the users. Hence, if you have an eCommerce website or a nonprofit website, you don’t need to pay for any third-party payment processing system. Interestingly, it can be implemented in-conversation with the Buy Button, or in the Messenger webview with tokenized payments. Non-developers can make use of no coding platforms like Chatfuel, Manychat, FlowXO, Octane, Recime and so on. These frameworks are used mostly to create rule-based chatbots. The chatbot tool matches the queries against the preconfigured database and responds to the users accordingly. So they lack artificial intelligence required to decode the intent of conversations and, hence, you can use them as a general purpose chatbot. If you want to build an AI-enabled chatbot, you need to possess the programming skills. Top chatbot platforms for building AI chatbots include IBM Watson, Microsoft Bot Framework, Wit.ai and Semantic Machines. If you have been looking for chatbot development services, you must be interested in chatbot development cost. Refer to one of our previous blogs How Much Does it Cost to Develop a Chatbot Application that takes into account different steps and tasks involved in the chatbot development, the time required and the hourly rate of a chatbot developer.